Rediscovering his bungalow roots, a Jersey boy returns to his hometown, tools in hand, to rescue a cottage by the shore. For our third installment in this series, we bring you new kitchens as well as kitchen renovations showcasing the best of classic Arts and Crafts style—easy to work in, easy to live in and easy to love. Turning his back on the National Park Service tradition of borrowing architectural styles from Europe, archeologist Jesse Nusbaum established a legacy of vernacular design for America’s national parks. The Lakeland, Fla., retreat of a Prussian immigrant, who made his fortune by giving Alexander Graham Bell a run for his money, is lovingly restored by his great-granddaughter. Rumors of Cleveland’s demise have been greatly exaggerated. Steady gains in employment, vibrant historic neighborhoods and a lively arts scene show a city on the upswing. Still, as the locals say, “Ya gotta be tough.” Click here to read this article online. The author takes a close look at the versatile bulb for year-round color in a variety of climates and discovers a useful “new” term for it—one that’s only a hundred years old. Praise for great fences and small bungalows; one writer illustrates a secret hallway and another searches for the perfect Dusky Rose. 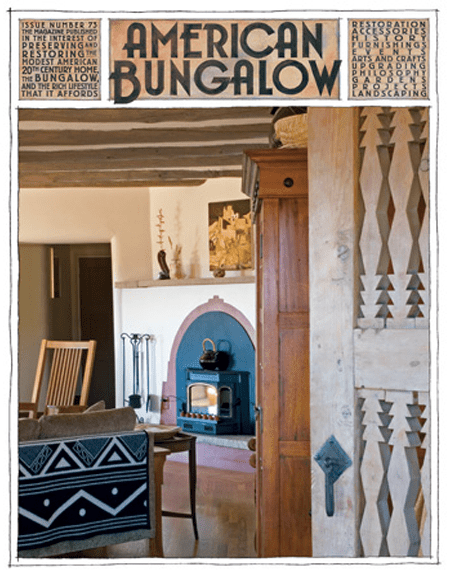 Across the continent, readers share their pride in their bungalows. The collectability of a Limbert drop-front desk, how to spruce up an old chair, and the unusual metal tags on a Stickley footstool. Click here to read. Christie Schorf-Miller and James Miller were destined to pursue the artistic life. But sometimes destiny needs a nudge.